TS Foods originally began as a popular fish and chip shop located in the small town of Castlewellan near the scenic Mourne Mountains. Husband and wife duo Tony and Anne Steele identified a gap in the market for value added coated products within the local food service sector. 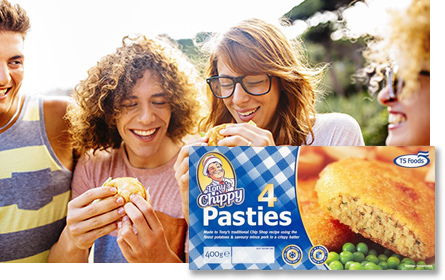 They worked together to create the iconic ‘Chip Shop Pastie’ the first of its kind to be sold to food retailers throughout Northern Ireland which was met with unprecedented demand nationwide. 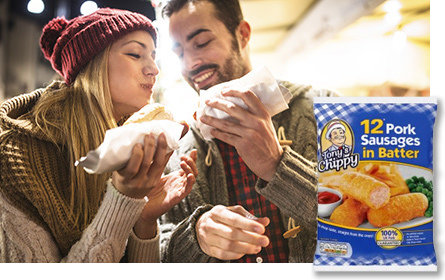 The aim for this brand was to provide customers with a chip shop experience they can create at home, saving both time and money. Tony’s Chippy has been on shelves over 20 years, and is as popular as ever, providing customers with the adored battered pasties, sausage in batter and battered beef burgers. Ryan from Belfast: “I enjoy Tony’s Chippy Pastie on a Friday evening after work, 2 pasties straight into the oven with chucky chips, I place the 2 pasties into a burger bap for a double decker and top with a little red sauce and vinegar for the chips and this is all for under £4.00”. 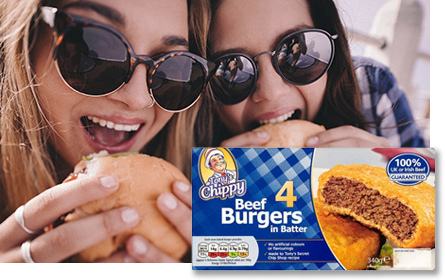 4 Beef Burgers wrapped in a crispy batter. 4 Potato & Savoury Minced Pork coated in a crispy batter.